Dalgaon (Kalimpong): If Mawlynnong can, so can Dalgaon. Mawlynnong, the Shillong village touted as one of India's cleanest, is set to face competition from Dalgaon in Kalimpong. The 200-odd households in this obscure village along the Bhutan border are determined to make their hamlet the cleanest in the region and also go organic - a two-fold formula that could push tourism in this picturesque hills. Dalgaon is situated on a hill overseeing the meaning Jhaldhaka river and the neighbouring Bhutan hills. Bikash Pakhrin, co-ordinator, Dalgaon Welfare Society: "The villagers here have always indulged in community clean-up drive but during the recent (104-day) strike period, it gain momentum as people started coming out of their homes and cleaning the place." Villagers have divided themselves in two groups who take turn to clean their village. Plans are afoot to set up seven group so that each group can clean their village every day in a week. Impressed with the initiative taken by the villagers, Gorkhaland Territorial Administration, had decided to extend a helping hand and has already sanctioned a sum of Rs 2.5 crore for the villagers' initiative. "Apart from this sum, the GTA is also repairing a stretch of road from Gairibas to Dalgaon, which is in a bad shape," said a GTA official. C. Murugan, secretary, GTA will be holding meeting with the villagers on Saturday to draw up the nitty-gritty of further development works. "In the middle of the village is a land that belongs to the cinchona plantations and the GTA plans to start organic cultivation of vegetables like tomatoes and sweet potatoes. Tourists will be allowed to plant vegetables and even pluck fruits if its ripe," said a GTA official. The place is already attracting tourists and a number of homestays have come up in the region. "The GTA has already developed a view point and constructed a resort there. GTA will further beautiful these points to give thrust to tourism," said another officials. "C.Murugan during the meeting will be working on plans to improve drainage in the village, create footpaths for locals and tourists to walk around the village and beautify the place," said a GTA official. The hill body also plans to create an open air amphi theatre when cultural events can be showcase to the villagers in the evening. "The idea is to make the cleanest organic village in the region and the entire community is involved in fulfilling this dream," said Pakhrin. If Mawlynnong can, so can Dalgaon. 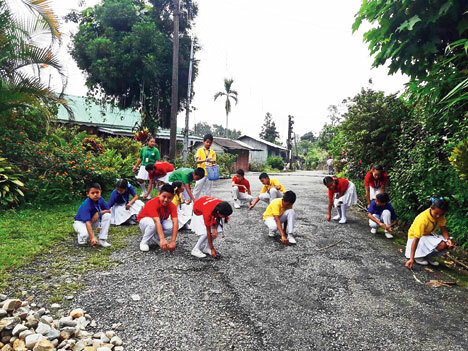 Mawlynnong, the Shillong village touted as one of India's cleanest, is set to face competition from Dalgaon in Kalimpong.